Specialising in Boat Repairs & Boat Maintenance for over 70 Years, three generations of the Sabberton family have offered their experience to customers old and new. From simple Boat Maintenance and Boat Repairs to work that can only be carried out by craftsmen, their watchwords have always been quality and customer satisfaction. Services Include:- Boat Anti-fouling, Boat Painting, Boat Engine Servicing, Boat Outboard Engine Servicing, Boat Engine Overhaul, Boat Glass Fibre Repairs, Boat Outdrive Servicing, Boat Winches Fitted, Boat Moorings, Boat Diesel/Water/Pump-outs. 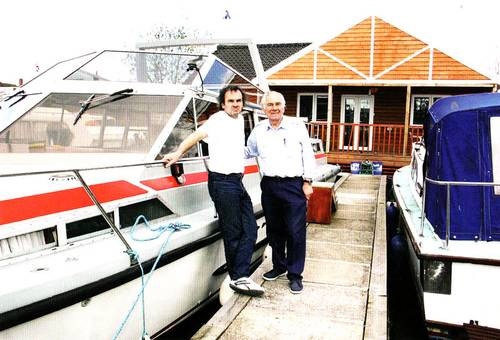 The current partners of Sabena Marine, Peter and Alan Sabberton; father and son. Previously, the business then known under the name of Sabberton Bros, owned and run by Fred Sabberton, Peter's father. To go back further, the Sabberton family had a boatyard on Riverside Road in Norwich in the 1920's. Although a large part of the business was hire craft, (from steam launches to 45' cruisers), there was always a building and repair side and it is this that is now situated at the Wroxham yard.